What Is the Plasma TV Refresh Rate? What Is a Sub-field Drive on a Plasma TV? Plasma TVs were discontinued in late 2014, but they had a lot of fans and quite a few of them ran out to buy up the last remaining plasmas available in stores. A lot of these TVs are still in use around the world, with many consumers still favoring the picture quality of a plasma TV over the now-dominant LCD TV. Although not offering advanced technology like 4K resolution and HDR, plasma TVs offer excellent black level and motion tracking performance. With regards to motion performance, sub-field drive technology plays a major part. The sub-field drive rate is a specification unique to a plasma television. It's often stated as 480Hz, 550Hz, 600Hz, or a similar number. If you still have a plasma TV and refuse to part with it, or find a refurbished or used plasma TV you think is worth purchasing, what does this mean? Plasma televisions were made by a variety of manufacturers including, but not limited to, those made by LG, Samsung, Panasonic, and Sony. Many consumers are falsely led to believe that the sub-field drive rate is comparable to the screen refresh rate, like the screen refresh rates commonly stated for LCD televisions. However, the sub-field drive rate on a plasma TV actually refers to something different. Screen refresh rate is how many times each frame is repeated within a specific time period, such as 1/60th of a second. However, although plasma TVs have a native 60Hz screen refresh rate, they do something in addition to this smooth out motion response further. In support of the screen refresh rate, they also send repeated electric pulses to the pixels to keep them lit for the period of time that each frame is displayed on the screen. The sub-field drive is designed to send these rapid pulses. Pixels behave differently in a plasma TVs than they do on LCD TVs. Pixels in an LCD TV can be turned on or off at any given time as a continuous light source is passed through LCD chips. However, LCD chips do not generate their own light, they require an additional back or edge light source in order to produce images that you can see on the screen. On the other hand, each pixel in a plasma TV is self-emissive. What this means is that plasma TV pixels generate their own light within a cell structure (no additional backlight source required), but it can only do so for a very brief period of time measured in milliseconds. Electric pulses must be sent at a rapid rate to plasma TV pixels in order for them to remain lit. The sub-field drive specification states the rate of how many of these pulses are sent to the pixels each second to keep the frame visible on the screen. If a plasma TV has a 60Hz screen refresh rate, which is most common, and if the sub-field drive sends 10 pulses to excite the pixels within a 60th of a second, the sub-field drive rate is stated as 600Hz. Images will look better and motion between each actual frame of video will look smoother when more pulses can be sent within the 60HZ refresh rate time period. This is due to the fact that pixel brightness does not decay as quickly during the time when a frame is being displayed, nor when transitioning from frame to frame. Although LCD and Plasma TVs outwardly look the same, there are definite internal differences on how they display what you see on the screen. 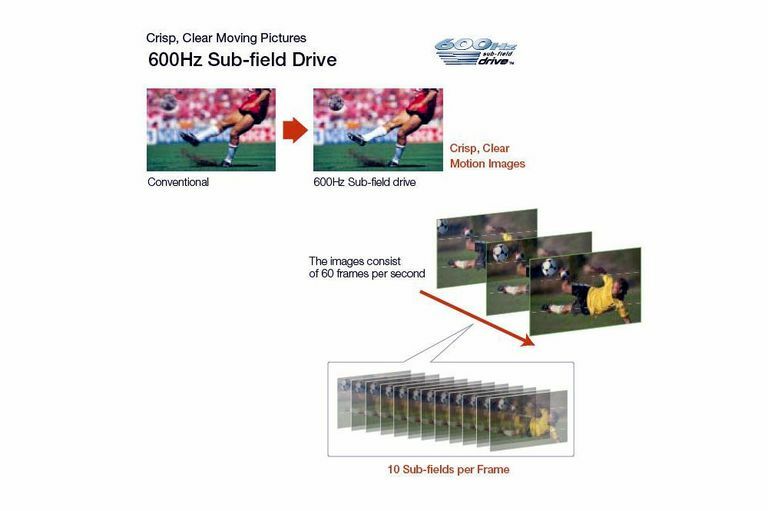 One of the unique differences in Plasma TVs is the implementation of sub-field drive technology to enhance motion response. However, just as with LCD TV screen refresh rates, this can be a misleading numbers game. After all, how many pulses must be sent per 1/60th of a second to see an improvement in motion image quality? Can a consumer really see a difference in image quality and motion between plasma TVs that have sub-field drive rates of 480Hz, 600Hz or 700Hz? The best way to find out is to actually do your own eyes-on comparison to see what looks best to you. However, one thing can be stated objectively; No matter what the sub-field drive rate is, Plasma TVs generally have better motion response than LCD TVs. Is it Better to Buy a LCD TV or a Plasma TV? How Are Video Frame Rate and Screen Refresh Rate Different?